Christmas Countdown: Christmas is just 21 weeks away! I am no by means a perfect crafter. In fact, crafting is hard work and always involves imperfections, at least for me. Add a baby to the mix and whoa! I hope you've got your seat belt buckled because you'll be in for one wild ride. Crafting with Bug has been so much fun. But it definitely is messy, and you can tell our projects are made by a baby. But I think that's kind of the point, don't you? 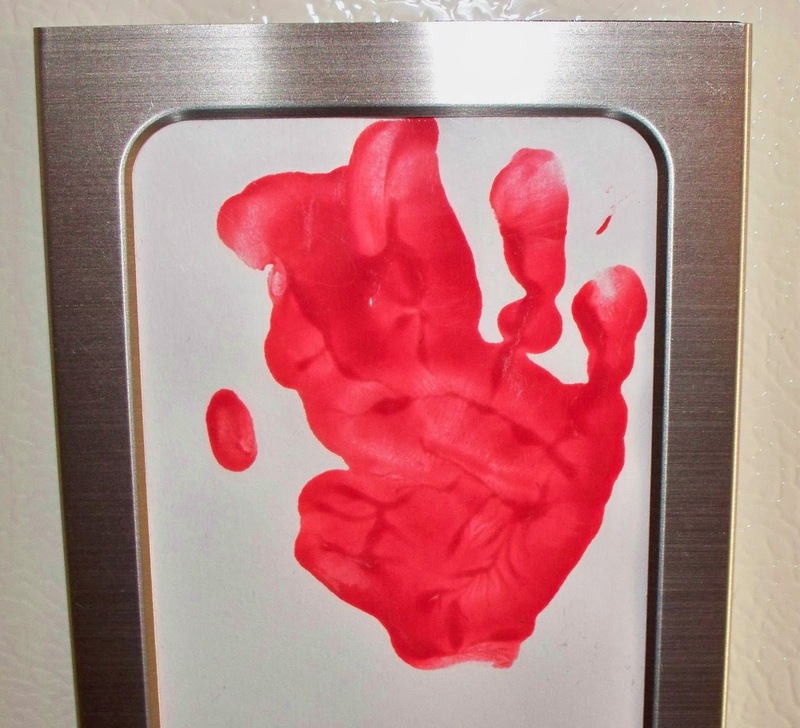 For Bug's first Christmas, she made hand print ornaments and framed hand prints. By far, the framed hand prints were much easier to make. We chose paint over ink due to Bug's age. We thought paint would be easier to work with. I don't know if that's true now that I'm on the other side of this craft, but I will say Bug thoroughly enjoyed the paint so that made it worth it. Also, I feel like the paint came off very easily from her skin, and I'm doubtful ink would come off that easily. I would personally wait to use ink until your little is older, but you can use ink with a baby. It really is your choice. Just be sure to get washable paint if you do opt for paint. Using a computer word program, type out your baby's name and the current year. Please note: to protect Bug, I've cropped the photo so it doesn't show her name and year. But I think you get the idea of what I'm saying with my directions here. We actually used her first name and middle name on one line, then entered the year 2013 on the second line. Print out several copies. I printed out four and only needed two. Using a ruler or the glass from the frame you've chosen, trace the dimensions of the frame on the white card stock and cut out the name and date, being sure the name and date are near the bottom and in the center. We put Bug in her high chair in a plain white onesie for this task. The paint came out completely, so don't feel shy about keeping your baby clothed. Once Bug was arranged in her chair, I came over with the plate of paint and the paper. Jason held her other arm and I took her hand, pressed it into the paint lightly and helped her open her hand and press down on the sheet of paper, one by one. We chose to do it four times, knowing we only needed two prints. We wanted to make extra in case some didn't turn out well at all. The one above was actually the second best print. We could have made more and I think as time went on, we all became better at the process, but this is a gift made by a then 9-month-old. I don't think anyone minds if the print is a little odd. I think that's part of the fun. Place the pieces of paper on a cookie sheet or some other sort of tray and let dry. Place each piece of paper into a frame. We all enjoyed making this project and plan to make something similar to this in the future. There are so many wonderful hand print and footprint ideas on Pinterest. Hand prints might be my favorite, but I do have to say that footprints would be easier for a baby. You may want to consider doing footprints for younger ones and hand prints for older ones. Either way, I'm just glad I've captured Buggy's tiny chubby fingers and palm.